Mayor Dave Bing is putting the call out to Detroit Public Schools and its students to clean and beautify the city. 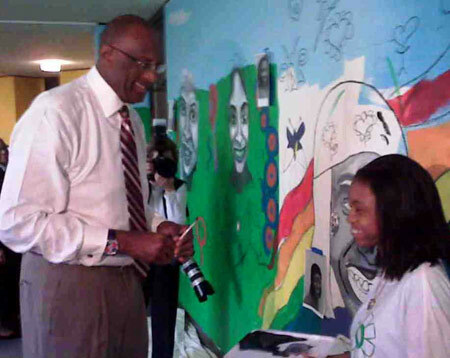 As part of the mayor’s 2010 Motor City Makeover initiative, schools and students are being asked to sign up and recruit volunteers to help clean, paint and beautify designated areas of Detroit. The community cleanup will take place on the first four Saturdays in May (May 1, May 8, May 15 and May 22). The schools that turn in the most MCM volunteer cards and/or online registrations under their school name will be awarded various prizes. Volunteer cards can be picked up by calling 313-224-4415, or volunteers can register online at www.detroitmi.gov. Students may also register individually and earn community service hours by cleaning up or beautifying a designated MCM location (listed online at www.detroitmi.gov or available by phone when registering). The purpose of Motor City Makeover is to keep Detroit clean and beautiful. All winners will be announced at a news conference with Mayor Bing. The grand prize for the winning school is an MCM trophy, a visit from Mayor Bing and a $300 gift card toward a school beautification project. The student grand prize includes lunch with Mayor Bing, a plaque and a $100 gift certificate. The first and second runner-up also get lunch with the mayor and $50 and $25 gift certificates, respectively. The kickoff to the 2010 Motor City Makeover was Thursday at Butzel Family Center, where the mayor, an NBA Hall of Famer and former Detroit Pistons’ guard, was joined by several other former players, community leaders, students and concerned citizens. NBA legend and former Piston Bob Lanier spoke on behalf of NBA Cares, while former University of Michigan star and former NBA player Tim McCormick represented the NBA Players Association (NBPA) and former Pistons center Rick Mahorn represented Pistons Care. Pistons’ play-by-play announcer George Blaha emceed the program.The NBA, NBPA and the Pistons have all pledged their commitment to helping motivate and encourage success for Detroit youth through the Leadership Detroit program.